I spent a few days in Colorado for a wedding and (shocker) rode the transit system there quite a bit. Oh, I hiked and trail ran, too. I didn't take a train trip, but did ride a variety of buses (including the spectacular N route up and down Boulder Canyon), but I did wander around Denver some, and was witness to the spectacular new Union Station project. It has a eight-track rail terminal (two pairs of three-track high-level platforms and two low-level platforms for long distance service) and a connected underground bus terminal which has access to nearby HOV lanes. And dozens of cranes erecting buildings around it. to move to the back of the bus to increase traction. Most impressive? The rail terminal is fully electrified. When Denver's Commuter Rail lines begin service next year, they'll be operated fully under the wire, with the same electrification (25kV 50 Hz AC) that Amtrak runs between Boston and New Haven. And they are planning to operate high quality service: some of the most frequent Commuter Rail in the country, with 15 minute headways all day on some lines, and never worse than 30 minutes between trains. Only a few lines in the country (in the New York area) can boast that kind of frequency. This is not the typical newly-built Commuter Rail built in the US. That would be what you get in Minneapolis, Nashville, Dallas or Seattle: moderately-frequent service at rush hour superimposed on a freight railroad and little service at other times. Legacy systems tend to do better, but the MBTA's service leans towards the latter, especially outside of rush hours, when most lines have service gaps as long as 2 hours (or in some cases, longer). Denver's Union Station terminal is particularly impressive. There's one MBTA commuter line in particular which could use more frequency: the Fairmount Line. Unlike most of the Commuter Rail lines, it doesn't stretch far in to the suburbs, passing through town centers, park-and-rides, and marshes and swamps. It has no four-plus mile gaps between stations, some of which are parking lots far from where anyone lives, with few riders off-peak. Instead, it serves a dense part of Boston with stations every mile, or in some cases, even more closely spaced. It should be run like a subway—like Denver is planning—yet it runs about as inefficiently as possible: service only operates once per hour, and that service is operated with a push-pull engine-and-coaches set-up which is suited far better to service Fitchburg, Middleboro or Rockport. The T's solution? It was to purchase diesel multiple units (DMUs) until the governor shelved that proposal (and quite possibly rightfully so). One potential reason? The projected cost for 30 of the vehicles was $240 million, or $8 million per car. 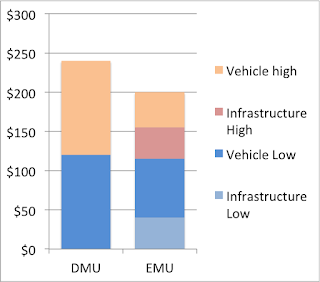 DMUs are relatively unproven in the stringently regulated US railroad environment (although they have more success in Europe) and the cost for such vehicles would be very, very high. That leaves aside the fact that DMUs are best used for low-volume, longer-distance services. Anywhere which has frequent service and closely-spaced stations is better served by electric service (as Denver decided). Yes, the up-front, in-the-ground infrastructure costs more, but the operation costs are much lower, to say nothing of noise and local pollution reduction. And with off-the-shelf rolling stock (which is much cheaper) and an electrification system partially in place, it winds up being much less expensive overall. The Fairmount Line is the perfect candidate for electrification. It is perhaps the most perfect candidate of any diesel line in the US outside of Chicago and San Francisco (where planning is in place to electrify Caltrain). It is only 9 miles long, and the final mile in to the terminal is already electrified (this would be by far the most expensive piece to run wire, but it's already there). It has, in those nine miles, eight stops, meaning that the much faster acceleration afforded by electric propulsion pays dividends in travel time savings. It serves a corridor which could easily support trains every 15 minutes (especially if they were better integrated in to the rest of the system), with high population densities and accessible stations. Parallel subway and bus lines are over capacity, and it serves a poorly-served region which currently relies on slow-moving, crowded buses. And best of all, both ends of the line are adjacent to existing electrification—the northernmost mile is already under the wire!—so it would not need to be built as a stand-alone system, but would be integrated in to the existing electrification. is a lower chance of cost overruns. Then there are the costs. Electrifying existing rail is not very expensive: generally in the range of $5 to $10 million per mile (Caltrain's costs, which are built to also allow high speed rail to operate, are $18 million per mile). Since this wouldn't be built from scratch—since it can tie in to existing electrification—costs should be in the low part of this range. Let's say it does cost $10 million per mile for the 8 as-yet unelectrified miles: that's an initial cost of $80 million. But then, instead of buying expensive, unproven DMUs, you can buy off-the-shelf electric multiple units, or EMUs. How off the shelf? Philadelphia and Denver both are running Silverliner V cars; in Denver's case, on the same electrification system we have in Boston. On the basis of power and clearances, it is quite possible you could roll a Denver EMU in to South Station and run it up and down the Providence Line tomorrow (signal issues notwithstanding). Philadelphia placed an order for 120 cars for $274 million: a per-unit cost of $2.28 million. 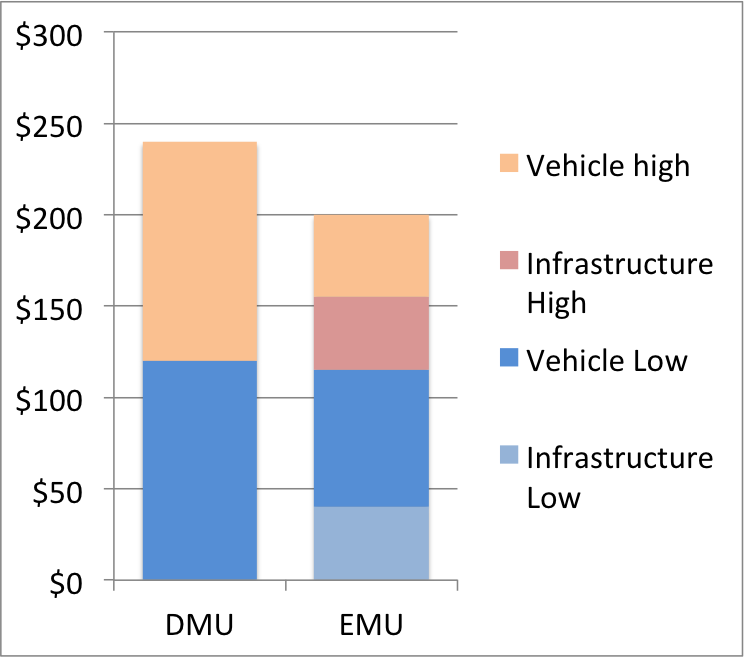 Even if Boston doesn't get quite the same volume discount, 30 EMU units would, at $3 million each (the approximate cost of Denver's units), cost $90 million. (2016 update: More-reliable M8s Connecticut just bought cost in the $4 million range, but include both third rail shoes and pantographs, which likely inflate cost somewhat.) Even with the initial investment in electrification, the total cost would be $170 million, 30% cheaper than that many DMUs! Even if a maintenance shop were needed (and Readville, adjacent to the end of the line, would be well situated for it), it would still come out cheaper. In the short term, heavy maintenance could be contracted out to MetroNorth's New Haven shops, and cars towed down the line as need be. Even at $4 million—the average cost of DMUs produced today for other systems—the EMUs plus the wire would come out even. An EMU is basically an oversized subway car: it's built for faster speeds and is heavier since it is in the FRA's domain, but otherwise has traction motors, a pantograph and a drivetrain. So it should cost about the same as (or a bit more than) a subway car, and indeed it does. The MBTA's procurement of Red and Orange line cars comes in at about $2 million per car, so $3 million is in the ballpark. M8s or Silverliners cost more, since they are larger and faster vehicles, but not that much more, because rather than having to be designed for the specific specifications of Boston's subway lines, they can be built to exactly the same specs as Denver or Philadelphia (although maybe we don't want those) and shipped out the door. at top speed, and save several minutes of operation time each trip. Then there are the benefits. First, electric trains are quieter. A lot quieter. Second, they don't need to be kept running overnight to keep from freezing up. Third, they have far less local particulate pollution (and if renewables are used for power, they are much cleaner overall), important for the environmental justice communities the line serves. And finally, they accelerate faster. A lot faster. The rail cars being used in Sonoma and Marin counties are spec'ed for 1.6 miles per hour per second (mphps) to start, and just 0.7 mphps at 30 mph. (This is much like an MBTA diesel-hauled train.) The Silverliners? 3 mphps to 50 mph, and then declining to 2 mphps at 100 mph. In other words: to reach 30 mph, it takes a DMU 31 seconds; to reach 50 mph, it takes 1:15. A Silverliner can reach those same speeds in 13 and 24 seconds, respectively. This means faster trip times, and operational savings. 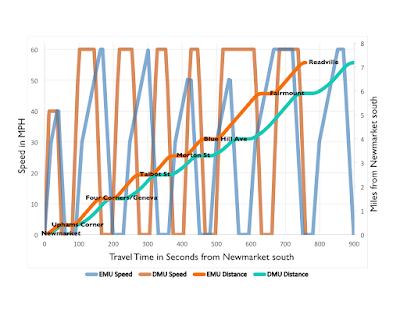 While a DMU train can cover the distance between Newmarket and Readville in 15 minutes, an EMU can cover that same distance in 12.5 minutes, even with the same top speed limit of 60 mph. With faster acceleration, the EMU spends a lot more time at that top speed, rather than chugging its way towards it (and with dynamic braking, it can also brake more quickly and efficiently). These time savings can either be put in to more frequent service, or more recovery time and fewer delays. EMUs could also be used on the Providence Line, where the higher speeds—SEPTA's Silverliners operate at 100 mph on the Northeast Corridor, the M8s have a similar top speed—would allow shorter, speedier and more reliable trips between Providence and Boston. Here's a video of a Silverliner on the Northeast Corridor north of Philadelphia. It's not accelerating at full bore, but still makes it to 50 mph within about 25 seconds and 80 mph within a minute (note the hard-to-see phone speedometer in the lower left). Thus in two minutes, from a dead stop, it covers 2.5 miles with an average speed of 75 mph. Electrified service on the Providence line would reduce run times by 25 to 33%—15 to 20 minutes—faster between Boston and Providence (depending on stopping patterns), dramatically reducing operating costs and allowing more service to run in the corridor, and attracting more passengers to boot. In the longer run, it would start the T down the worthy path of electrification. In addition to Fairmount, 13 additional miles of wire would fully electrify the Stoughton and Needham lines, both of which use the already-electrified Northeast Corridor for part of their runs. Franklin would be a next best bet; a third of the 32 mile line already operates under the wire. Thus, for 42 miles of overhead—an investment in the range $200 to $400 million (plus another $50 to $100 for high level platforms)—the T could do away with inefficient diesel service on four of its commuter rail lines, which would serve as a springboard towards the future electrification of the rest of the system. The cost savings alone would likely tally to millions of dollars per year. It is silly to run diesel service under a wire. While MARC, in Maryland, is moving away from electrics, it is really beyond explanation. Part of it may be that they are charged high rates for electricity by Amtrak, which owns the wire and track. The T, which owns the tracks, has a better negotiating position with Amtrak for electricity prices. But MARC is bucking the trend: most non-electric commuter railroads are moving towards overhead power. All-electric SEPTA is buying new electric motors as well as EMUs, Denver has started all-electric, Caltrain is moving towards electric operation, and Toronto is as well for its sprawling system. Running Fairmount under a wire would make more sense than any of these systems. With DMUs delayed, the MBTA—which has long since had a distinct allergy to modern equipment in general and electrification in particular—needs to take a good, hard look at its cost and operational benefits of electric propulsion. It makes sense not only from an operational, pollution and environmental justice standpoint, but from a financial standpoint as well. Electric operation has long been anathema for the MBTA. But it makes operational and financial sense. It should be seriously considered. -- Amtrak's Shoreline electrification requires a paralleling station once every 6 miles. As there's already one at Readville (https://goo.gl/maps/ErpuAVSMaiB2) the only on-line electric infrastructure required besides the running wires is a paralleling station somewhere at the Fairmount's midpoint. -- However, you must upgrade the capacity at Sharon substation (https://goo.gl/maps/9WWLpUwVV2v) to be able to run commuter rail electrics on NEC or Fairmount. Amtrak oh-so-helpfully left the power draw of the 2000 electrification too short to handle anything but their own trains. Hence, it's the T's $$$ to fill up that empty half of the substation with capacity expansion. Especially for EMU's, which gobble more juice than an electric push-pull. But..said substation expansion would feed both Providence and Fairmount, so it's a non-optional expense with payoff. -- Silverliner V derivatives won't be a viable option. Those were horribly botched Rotem product and design that nobody's going to buy again. The same factory that produced the T's Rotem coach lemons did the Silverliners, and they have same problems of rickety build quality (e.g. too many little plastic things breaking off, rattles and shakes, generally poor attention to fit/finish little things, "less-than-solid" overall feeling) and...worst...incoherently-mapped spaghetti wiring done by incompetent electricians. SEPTA's probably starting from scratch with the Silverliner VI design. Denver benefits from SEPTA having to go through all the debugging pain ahead of them, and thus it was a worthwhile buy...but they're going to age very poorly and be passed over for a 25-year rebuild. One-and-done oddities. -- The EMU make to watch is the bi-level design NJ Transit's currently contracted out for specs engineering for its Arrow replacements. RFP likely issued in '16 or early '17. That one will take the ubiquitous Bombardier MLV coach carbody and lash it up into a conventional married-pair EMU at no loss of seating from the regular coach version. Has advantage of recycling a carbody that's in constant mass production, which should keep unit costs reasonable if matched up with proven propulsion systems. If SEPTA were wise it would tag along with NJT's order with a parasitic option, let NJT be guinea pigs, and save itself the masochism of bumbling through managing another Silverliner design generation. Throw in AMT likely ordering the same when it expands electrification, and you've got something resembling a 'universal' domestic EMU for high-platform territory where a constantly hot factory pushes down cost. No, they don't tickle the imagination of those who'd prefer lightweight Euro imports instead of another overweight North American beast, but it would lower the barrier of entry considerably for the MBTA's of the world to finally take the EMU plunge. Resist urge to over-customize or lard some idiotic "Buy Massachusetts" on top of idiotic "Buy America" bloat, and they can get good scale for a Providence + Fairmount + RIDOT Providence-Westerly pool fleet. Probably cheaper and lighter-weight than NJT because they can omit the 12.5 kV and 25 Hz transformers and just order the solo 60 Hz/25 kV version. Bi-levels might not be as efficient for boarding on Fairmount as the specialized interior config the DMU's were supposed to have, and obviously wouldn't be able to have center sets of doors that match the platforms. But they have to be thinking of fleet scale for this starter electrification and what's going to serve Providence + Fairmount + RIDOT in one pool. Optimized interior flow for hyper-frequent service inside Route 128 is something they can worry about next southside EMU order when they get Worcester wired up and lather on hyper-frequent Riverside trains. That third Worcester electrification is all it takes to put the southside at well >50% electric fleet. * Re the paralleling station for Fairmount, could this be run off of power from the Amtrak yard up in South Bay? Or is that a little too far? * I assume that the Sharon upgrade would be expensive, but not overwhelmingly. i.e. if it's $10m but it allows for the use of 50 miles of electric running, then it's a small overall expense. * I picked Silverliner Vs as the example because a) they're used in a setting outside NYC (Phila, Denver) and b) the Denver cars are lined up for 25/60 which is the juice already flowing above MBTA trackage. Obviously other cars could be wired for it since it's pretty standard (more standard than Pennsy electrification further south). But the long and short of it is that the experience with FRA DMUs is not illustrious: the Nippon-Sharyos out west are not proven, and the Colorado Railcars are proven, but not in a good way (cars are bad, company went under). EMUs are quite proven and there's a competitive market, so the T could buy cars based both on cost and track record. * And, yes, if you're doing electric, the 5 miles to Stoughton make sense, as do the 9 to Needham, right off the bat. The 20 to Franklin and 45 to Worcester are a bigger deal, but you would be well through the system (oh, and more ridership, too). Sorry for the late reply. . .
1) Paralleling stations are basically large circuit breakers, so they're necessary. Sharon substation has taken lightning strikes before, and you don't want that frying everything clear to Boston and Providence because of lack of phase breaks. Rule of thumb is one every 6 miles, fudge factor on placement where there's available space. Four Corners-Talbot Ave. stretch is pretty densely-abutted, but they have leeway because midpoint on the line is well under 6 miles from the next-nearest installation. 2) Yeah. Amtrak was being chintzy there, but there's only 3 substations on the entirety of the Shoreline (1 in each state), so it's a lot of bang-for-buck to be able to power the whole terminal district, Providence Line, and Fairmount out of one single substation. RIDOT would be on the hook for similar upgrades to Warwick substation, but they'll gladly do that since it takes care of both Providence Line and Providence-Westerly intrastate commuter rail. These sites are provisioned for exactly that expansion with half the space at Sharon left empty and those giant honking high-tension lines about 1000 paces south supplying half of southern MA with juice. The T would be wise to think ahead and spend for more capacity than they need, because that'll take care of all service growth in the terminal district when North-South Rail Link and South Station Under get added to the mix. 3) Only reason I mentioned the SLV's being an asterisk is because AC bi-level EMU's are finally ready for prime time in the U.S. (piggish FRA bloat or no), and everyone who isn't wedded by physical necessity to a single-level design like LIRR/MNRR's M#'s is going to be buying bi-levels going forward. SEPTA too unless they fail to learn their lesson and attempt another custom design reboot with the Silverliner VI's. Otherwise, there's no great aura of mystery around EMU purchases. Only reason to go uniform bi-levels first and not take a very small order of subway-ish configured flats is fleet scale for the initial vehicle purchase. Taking the first plunge kind of requires a uniform fleet to hit optimal cost/benefit. But as long as you keep up the pace on subsequent electrifications you'll quickly pile up enough inside-128 Indigo Line routes to hit paydirt scale with the specialized configuration. Providence + Worcester + Fairmount is almost 60% of the southside equipment pool, and Fairmount + that Riverside Indigo route are the biggest chunks of that proposed faux-subway route network. It scales quick so you can/(will?) have both. Just, all in due time because that first step into electrification is such a doozy. 4) Stoughton just depends on whether South Coast Rail, or even a more sensible Phase I to Taunton Depot, is still in the cards. They could certainly de-crapify that build and its beyond-awful headways by doing Taunton first + extending all Stoughton trains at equal-or-better headways. THEN some time later double-tracking and THEN and only then building the branches, instead of crippling that turd sandwich from the arse-end-backwards with a monolithic build at single track. So if Stoughton begats Taunton (and future service-increase turns at Taunton), you probably don't want to electrify Canton Jct.-Stoughton until you've settled up all the denser-traffic lines first. It would require its own independent substation built somewhere in the Raynham stretch, and that changes the cost valuation considerably. Obviously, if SCR gets a fatal ice pick to the head...by all means, take the free throws and string 'em up to Stoughton because it would chain off Sharon substation splendidly. -- Worcester is easy. Plenty of power lines out in the Westborough-Grafton stretch for plunking a substation, and only overhead bridge inbound of Westborough that needs to be touched is Beacon St., which is too low to clear a T bi-level under wires. Worcester-Westborough where the double-stack freights roam you need to have 23'1" underclearance (20'6" car clearance + 2'7" for 25 kV wires over an unshielded metal roof). Only 6 bridges out there, some of them already clear (e.g. I-290), and all of them can be squared by an quick/cheap trackbed undercutting. You're not wiring out to Springfield, however, without lots of suffering; that's 35 more bridges. -- Big problems, however, on Haverhill/Downeaster between Wilmington and Portland, and Fitchburg west of Littleton to Wachusett. Those will be bigtime double-stack freight routes in only 5-8 years, and both routes were not as luxuriously overbuilt as the Boston & Albany so they're going to exhaust all available space getting to 20'6" (Western Route's only 17' today). Entirely possible you may never be able to justify cost of electrifying Haverhill past Reading and Downeaster to Portland (unless it got shifted to a Maine-reconnected Eastern Route). Fitchburg outskirts: easier path, but you're probably kicking it everything past a Waltham/128-turning Indigo route to the back of the line and dealing with it last. At least the N-S Rail Link is designed to take dual-mode hauled push-pull trains without slowing down the EMU's, so long as they stay a decided minority of the traffic. -- Needham is a special case because it's always, always at the bottom of the pile for NEC slots. No matter how much you modernize ops and train spacing, Providence/Stoughton and Amtrak are always going to be first in line to be fed. They priced out a widening of the SW Corridor tunnel/cut to 4 RR tracks + 2 Orange Line tracks about a decade ago (it's floating around the Interwebs in a PDF somewhere), and it was a $1B job with unacceptably destructive surface impacts. Franklin trains have options via Fairmount to keep everyone fat and happy, but Needham is forever runt of the litter. Only equitable solution is to finally trade it over to rapid transit like has been periodically proposed since 1945: Orange swallowing to West Roxbury (or 128...but it's pretty desolate out in Cutler Park), Green branch off Newton Highlands swallowing to Needham Jct. (yes, you have to tag-team both so nobody loses transit). It's a "when" not "if" Needham gets squeezed out of meaningful service expansion options by exploding NEC growth, so rapid transit ends up the only electrification that ultimately matters. Might as well get it over with. -- Franklin has logistical hurdles requiring more thought than it looks on a 2D density map. It has the fewest power lines--one set, halfway between Walpole and Norfolk--crossing it of any long-haul mainline. And if those aren't configured to feed 25 kV (not all are), you'll be building an interconnection to the NEC in Mansfield to balance the supply. It's also a freight clearance route Walpole-Readville protected in perpetuity by interstate commerce law. The last one into Boston-proper on the southside now that CSX signed its life away on Beacon Park. With a lot of overhead bridges maxed out on under-clearance. Plan carefully, because you only get one shot to square up unprojectable 50-year economic considerations on movement of goods. Massport wants to do ship-to-rail container freight at Marine Terminal in the next 7-10 years, and it's unprojectable over 50 years if Ports of Southie and Quincy start chucking in economically reliant freight volumes...like they did 50 years ago. Don't block the only way to move high-volume goods in/out of town; you may need it. If that means deferring Franklin further down the list till you have the money to tackle the bridges...do the smart thing, not the impatient thing. One note on the electriication system: the Sharon substation only supplies the section north/east of the phase break just north of Attleboro. South of there and through most of RI, the power is supplied from a substation near the Providence Airport. Presumably, Rhode Island might be convinced to fund the necessary upgrades for that section. 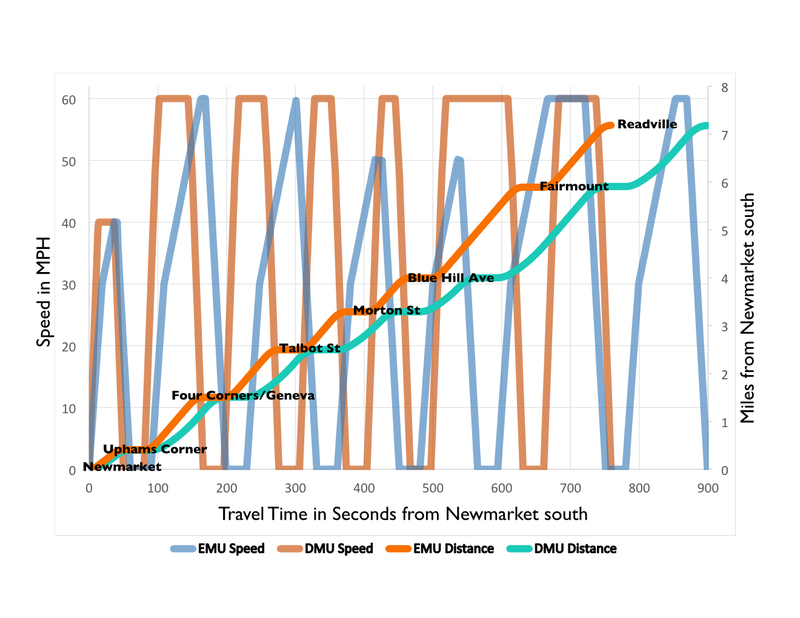 Also, if the improvement in travel time from DMU to EMU is accurate, that is huge: it means only two EMU sets are needed for a 30 minute clockface schedule versus 3 DMU sets, because the DMUs wouldn't have quite enough recovery time at the terminals. Fairmount Line desperately needs electrification as it involves less cost in a long run. Buying diesel multiple units is very cost effective. The governor’s direction to reduce the purchase of DMUs is praiseworthy. Though DMUs have achieved success in Europe, it cannot be believed that the same would happen in Boston. MBTA should take steps to complete the electrification of the nine-mile long route. As there is existing electrification adjacent to the both ends of the line, it can be integrated in to the existing system. Electrification of the existing line does not require a big sum.